How To Know You Are Vacuuming The Right Way? Keeping your home clean is important; getting the right balance between cleaning and doing more than you need to, is a fine balance. But when you are short on time and energy, getting the most out of a task is important. That is why knowing how to vacuum the right way, is often easier and less intensive than battling vacuuming and doing more than you might need, wasting your precious time and energy. Getting the balance right is the most important point, wanting a clean and organized home and still having time to do the fun stuff is important. Vacuuming the right way isn’t as difficult as you might imagine. The idea that there is a right and wrong way to vacuum is not the intention, you have to feel confident in your own abilities, but if there are easier options, it is important to consider the impact to your home and life. You don’t have to vacuum the whole room every time. Try just doing the high traffic areas, this might be all you need to tackle. The idea behind this is there is little point in vacuuming the whole room if only some actually needs cleaning. This saves time, energy and sanity when it comes to vacuuming and the speed in which you can complete the task. The frequency that you vacuum can have an impact on how long the task takes. The more frequently you do this task, the quicker the task and the less likelihood of having to spend a long period getting the carpets vacuumed and clean. The high traffic areas of my home, I like to vacuum daily or every other day depending on other commitments that I have. Vacuum manufacturers provide tools to aid the use of their appliances, it is a good idea being familiar with how they work and the tasks they are capable of completing. They are there to make the job of keeping your home clean; use them, it will aid in how you are able to keep on top of your cleaning. A vacuum cleaner is only able to get rid of so much dirt from your carpets and floors. There is a point when you need to do more than just vacuum. Carpets get dirty no matter how hard you try to keep the dirt out; at this point, you must think about your options for doing a deeper carpet clean. Having pets I have always had my own carpet cleaner, it is something that I have felt it is important to have, it allows me to deep clean my carpets. When to vacuum in your cleaning routine is important, the best time is the end. This way you are collecting all the dirt and dust from other cleaning activities. However, I like to vacuum first, a dirty floor really bugs me and for this reason only, I like to get this area clean first. Yes, I have been known to do the floor again. But knowing where you like to put it in your cleaning gives you a clear order for your cleaning schedule. The more that you understand your routines, or know what you like when it comes to your home, the better you can plan your activities. 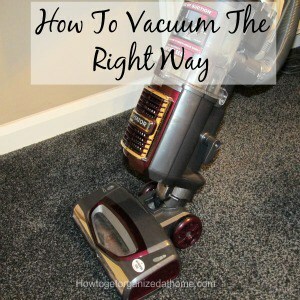 Vacuuming the right way is understanding what you need to do and not doing too little or too much! It might seem like a drag to plan your cleaning into your day, you might have a set schedule that you complete, or you might just clean at a certain time of the day. It doesn’t matter, what is important is that you think about your needs and that of your family and adjust the time you have to do the tasks. Vacuuming is a great task that can easily be a chore for your children in your home. It doesn’t need perfection, sometimes it just needs a quick vacuum for a room to look so much better than before. For my children, when they were younger, vacuuming was always the task they fought over, it was the easiest option to do! This will depend on the budget you have available, some prices are just crazy and others are more reasonable yet unfortunately, they don’t always perform the best. Vacuuming the right way can depend on the tools we use too! I was a Dyson fan for many years, I think my last one lasted over ten years, so it was very good value for money. However, when it did come to the end of its life and I needed a new vacuum the cost of a Dyson was just too much, I couldn’t justify the expense, which was when I turned to Shark and found a brilliant product. I couldn’t believe the cleaning power and I have been extremely happy with my purchase. The point that I am trying to make is that you need to look at what is available and not judge a product before you give it a go. You might find the perfect vacuum for you, in your budget, don’t be afraid to ask questions and to go over the important factors that you are looking for in a product and try them before you buy them! What are your best tips for vacuuming the right way? Therefore, if you are looking for vacuuming tips on how to achieve the most with the least amount of time, you might need to change how you tackle your vacuuming. Doing it more frequently often means that there is less work and it is quicker. Looking for more articles on this topic? Head over to the landing page where you will find links to other articles on cleaning! I wrote another article I think you will like. How To Vacuum The Right Way .